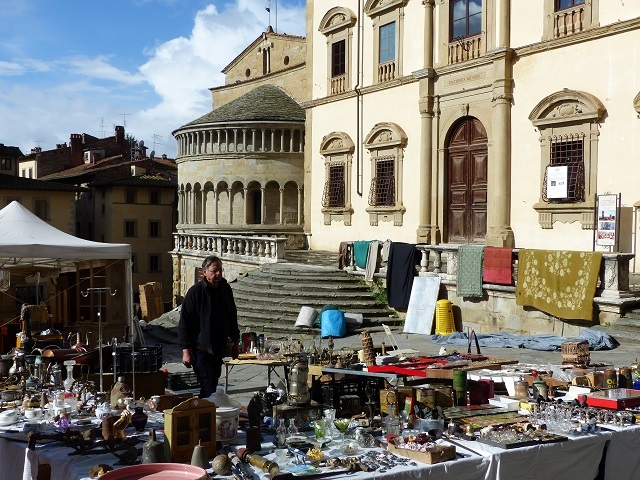 On the first Sunday and the preceding Saturday of each month Arezzo holds an amazing antique market. 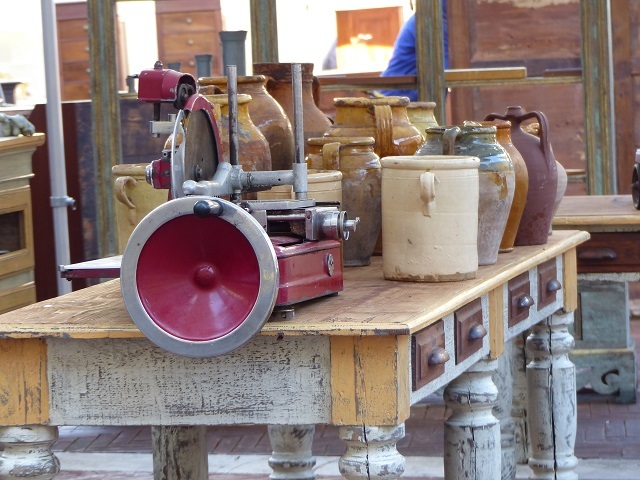 The tradition began in 1968 and it has grown to be one of the biggest antique markets in Italy, with around 500 exhibitors on a fine week end. 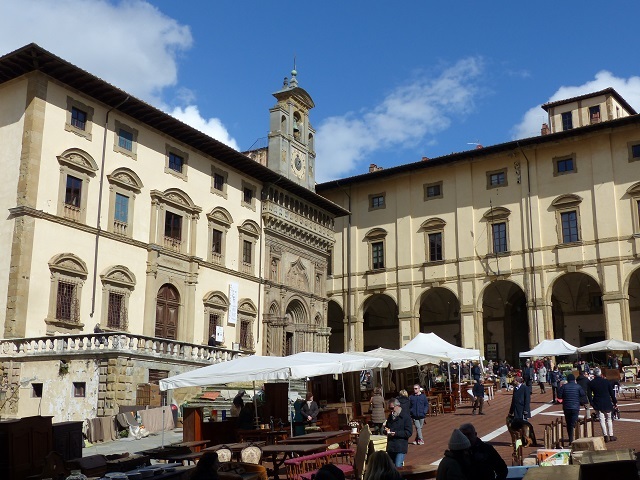 The main part of the market is held in the beautiful Piazza Grande, the heart of Arezzo. The setting is spectacular. The piazza is surrounded by gorgeous buildings, including the Apse of the Chiesa Santa Maria della Pieve and the Palazzo del Tribunale with its beautiful semicircular staircase. Beside this is the Renaissance masterpiece, Palazzo della Fraternita, with its bell gable and clock dated 1552. At right angle to these is the Palazzo delle Loggia del Vasari, built between 1572 and 1595. Lucky stall holders who set up here are sheltered from the weather and have a great vantage point over the piazza. The exhibitors also spread through the streets of the city, so take the time to wander through the narrow laneways. There are treasures at every turn. 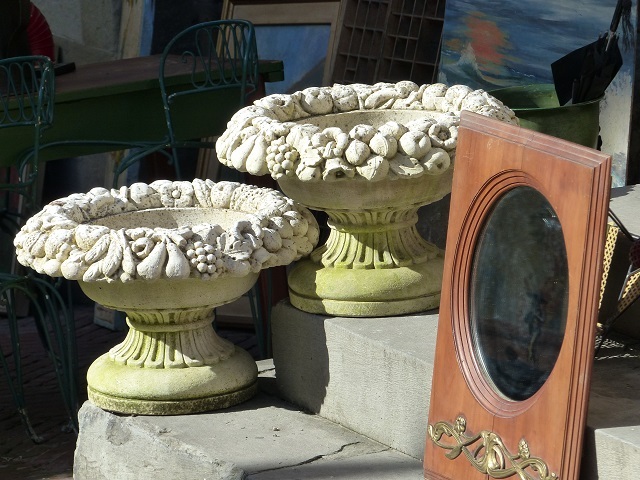 There are old terracotta pots, photo frames, children’s toys, crockery, tables, light fitting…just about anything you can think of at the markets. 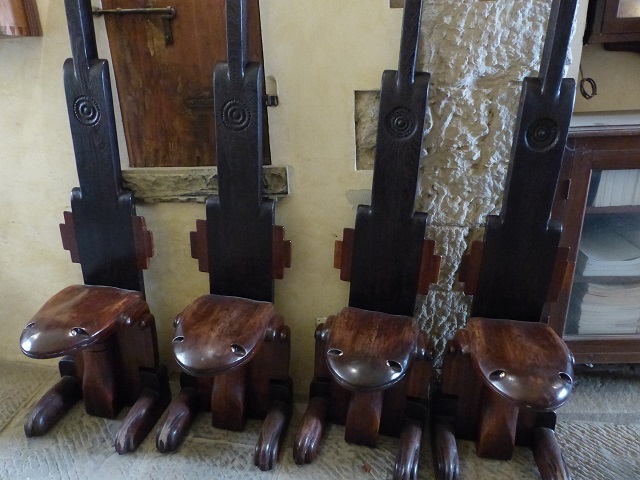 Do you need this set of frog chairs? 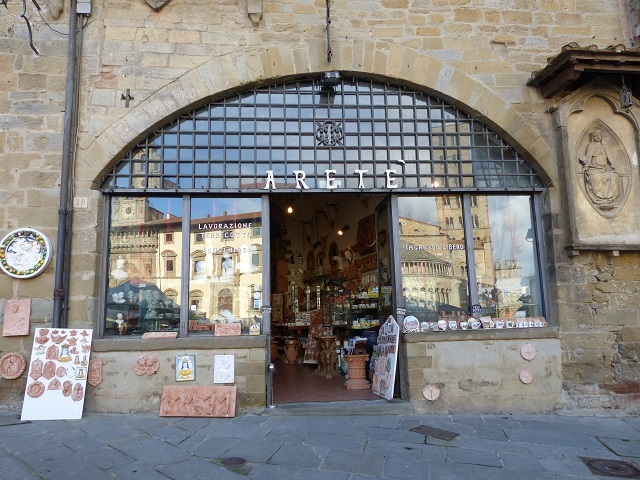 There are also very very good shops in Arezzo, so you can wander through those as well as the market stalls. One of my favourites is Arete, full of beautiful terracotta items. 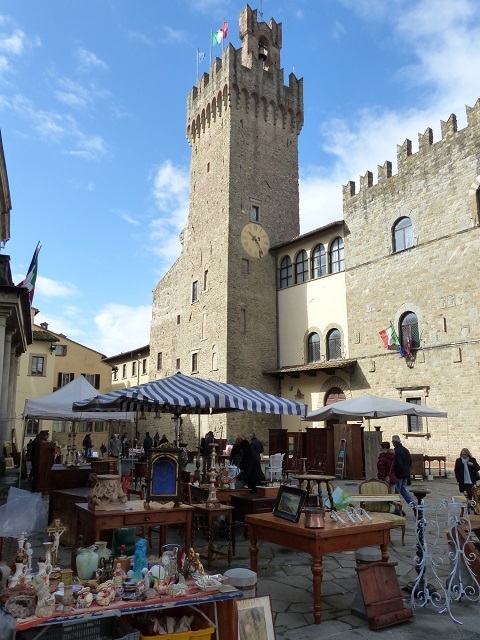 It would be a good idea to spend the weekend in Arezzo and alternate treasure hunting with visits to Arezzo’s delights. Don’t miss the frescoes of Piero della Francesca. His most famous work, The Legend of the True Cross, is housed in the Basilica of San Francesco. 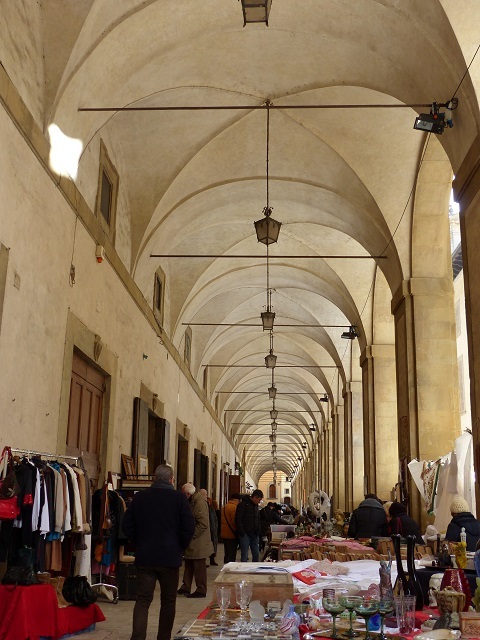 If you like to shop in a great setting don’t miss Arezzo’s antique market. Driving into Arezzo is restricted on market days and fines will apply if you end up in the wrong place. Take advantage of one of the car parks just outside the walls of the town and walk in. Concierge tip: Visiting Tuscany? 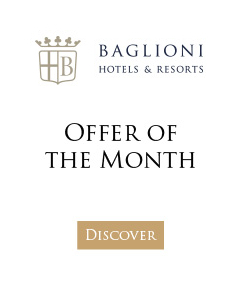 You can now enjoy a stay at the romantic Relais Santa Croce – an intimate luxury boutique hotel in the heart of Florence – and combine this with a signature Baglioni VIP Experience such as an unforgettable balloon ride over Tuscany or a private tour of a local vineyard. If you liked this article, you may also enjoy Discovering Delightful Arezzo in Tuscany.